"I have to constantly pinch myself to remind me that what's happened over the past few years has been real - to have gone from making music in a dorm room and fantasizing about recording and touring professionally to actually doing just that continues to blow my mind on a daily basis. We're living during an incredible time for young, independent musicians, and I feel so amazingly lucky to be a part of this space and this vibrant, new world. Making music and performing are what I've always dreamt of doing with my life, and the internet has allowed me to connect with fans from all over the world who are making that possible. And what's most incredible about this digital medium is how much of a two-way street it's made of the fan-artist relationship - I love engaging with you, the people who listen to my music, and at the end of the day, knowing that you've found something in my work that speaks to you means more to me than I can possibly describe." Sam Tsui has been hailed as an internet singing sensation, who along with his production partner Kurt Schneider was among the first musicians to establish a hugely popular music-focused channel on Youtube. To date, his videos, including covers, medleys, and mashups, have amassed over 500 million hits on Youtube alone, with each new release, including his debut original album “Make It Up”, and his brand new 2018 album "Trust" contributing to his ever-expanding worldwide fanbase. A graduate of Yale University, Tsui has been able to harness the ever-changing tools of the digital music age to independently create an internationally popular channel and brand, garnering him countless TV and magazine appearances, including the Oprah Show and Ellen Show, and brand partnerships with brands like Coca Cola, Kia, McDonalds, and Samsung. Turning his digital success into ticket sales, he has toured extensively throughout the US, Asia, and Australia, with plans for more touring in 2018. Sam continues to use his powerful digital platform to share his distinctive music and creative video content with his fans, the "Samily". Click the album art to get this music on iTunes - most titles are also available on Google Play and Spotify!! 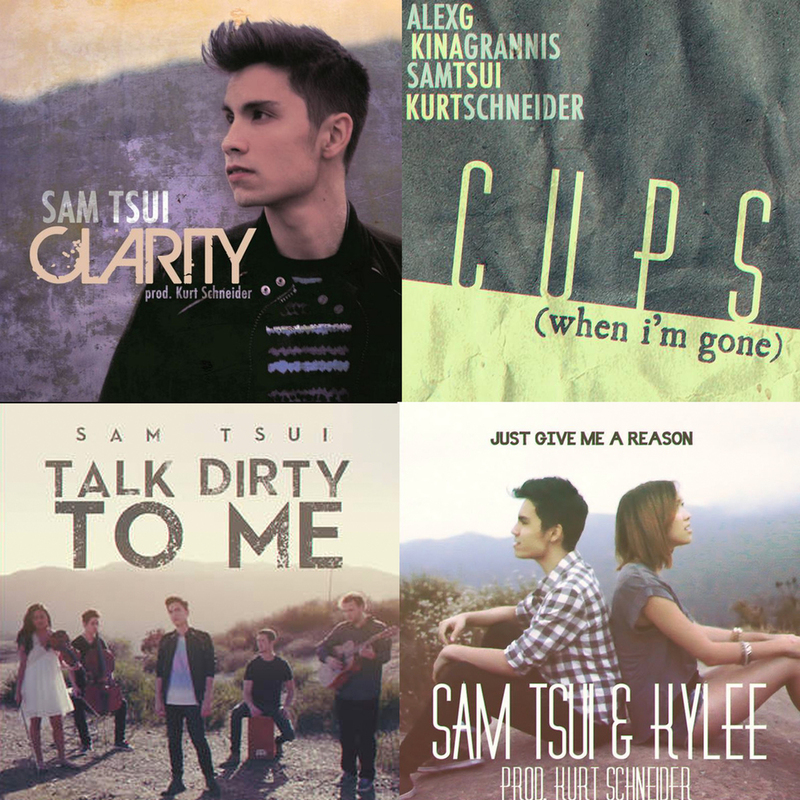 The debut original album written by Tsui and produced by Kurt Schneider, created with the help of fans from around the world who donated to the duo's Kickstarter campaign. Singles include "Make It Up", "Shadow" and "Wherever You Are"
A three-song EP written by Tsui and produced by Kurt Schneider including "Wildfire" and "Love and Us" - was released in anticipation of the 2014 Asia Summer Tour. Many of the covers and medleys found on Sam's Youtube channel can be purchased from the iTunes Store, Google Play, and listened to on Spotify - find out which tracks are available! The brand new 12 song album, featuring "Cameo", "Trust", "Clumsy", "Just For Tonight", and more - all written and produced/co-produced by Sam, the album reflects a new and mature sound and direction.